The Spaniards came to Colombia in the early 16th century with dreams of gold and visions of El Dorado. 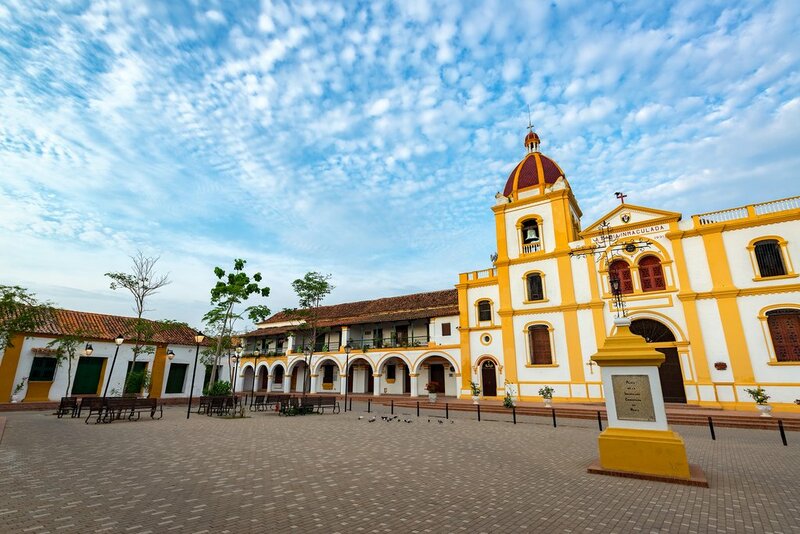 After the new country won its independence from Spain in 1819, the colonialists were finished, but they left behind a legacy that's still seen today in Colombia's many well-preserved colonial towns. This article lists the most unique throughout the nation. In Norte de Santander (the northern edge of Colombia's Santander Department) lies La Playa De Belén. Literally translated to Bethlehem Beach, the name is a glaring misnomer in the sense that there is no beach in this inland village in eastern Colombia. This is probably the least-visited colonial town on the list, so if you do come here you'll likely be the only traveler in town. 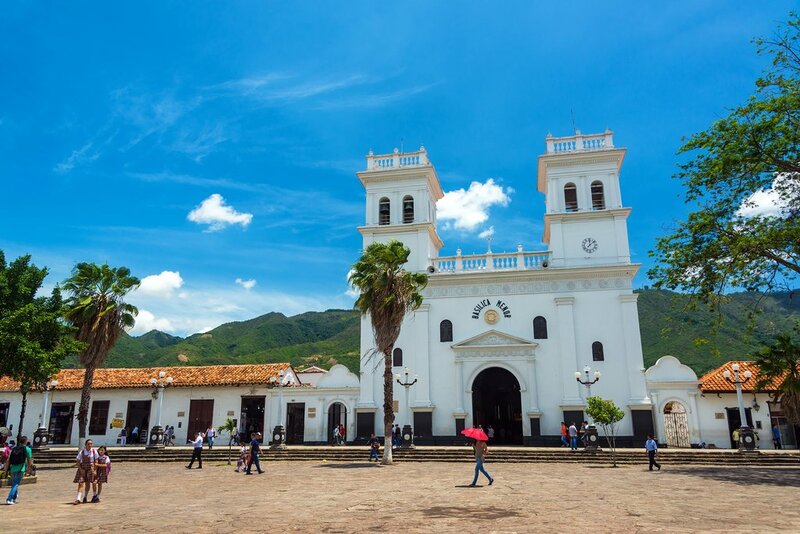 The principal attraction in this small town is the colonial center, which features cobbled streets (three total) and a small central plaza dominated by a church with twin domed belltowers. If you head to the edge of La Playa de Belén, you can hike up to a great viewpoint: the local cemetery. With its bright white crosses and tombstones, the cemetery is actually quite pleasant and features panoramic views of the town and surrounding countryside. 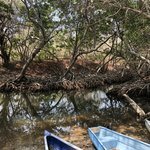 If you venture just a few minutes outside of town you'll find Los Estoraques Unique Natural Area. This 640-acre protected park features a number of towering rock formations that have been sculpted by erosion due to wind and rain over thousands of years. The result is that today many of these formations resemble gothic towers or the remnants of some mythical fortress long lost to time. La Playa de Belén is mostly accessible via the larger town of Ocaña, which is located 45 minutes away. However, northbound buses from the city of Bucaramanga, the capital of Santander Department, will drop passengers off before Ocaña at the crossroads leading to La Playa de Belén (when requested). The bus trip is about five hours from Bucaramanga to the drop-off. Buses also run here from the Caribbean towns of Mompox and Valledupar (also about a five-hour drive). Santa Cruz de Mompox exudes a mythic quality. This romantic Caribbean backwater in the Bolívar Department is so far off the beaten path that few travelers get the opportunity to visit. Founded in 1537 on the Magdalena River, its location inland from the Caribbean Sea meant it was safe from pirate attacks. This remoteness also resulted in little intervention from the outside world over the centuries, and the city has held on to its colonial charm. You can see it all in a day: Stroll the cobbled streets and the riverfront, taking in the colorful buildings featuring artisanal wrought-iron doorways and windows. Be sure to sample queso de cappa, a local cheese that's slightly sweet and available from street vendors. Browse the filigree jewelry produced by local goldsmiths, and consider taking a canoe tour of the nearby marshlands and mangroves. Arriving in Mompox is a bit of an ordeal. Buses run from Cartagena, a five-hour route along the Caribbean lowlands. It's possible to connect by ferry from the town of Magangué, also located in Bolívar. There are routes to Magangué from other parts of the Caribbean as well as Medellín, and there are direct bus routes to Mompox from Bucaramanga (the trip takes about eight hours). One final thing to note: Mompox gets hot. Temps range from 80°F and 95°F year-round, but trust us, the afternoon heat and humidity can be oppressive. Do like the locals and hit the sack around mid-day for a nice little siesta. Girón is a gem of the Río de Oro on the outskirts of the modern metropolis of Bucaramanga—in fact, the town is located 5 miles west of "Buca," so you could swing by just for lunch even if you can't do an entire day trip. 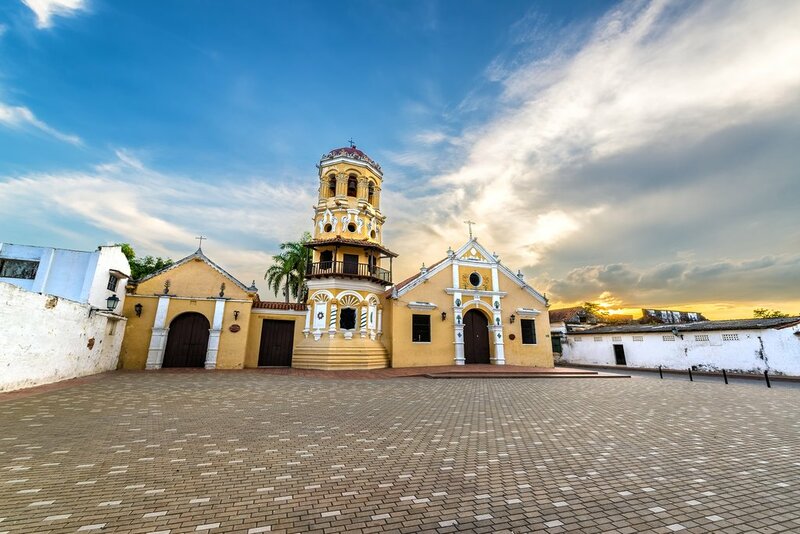 The most eye-catching landmark in Girón is the colonial church, Catedral del Señor de los Milagros, with its white-washed facade and imposing twin bell towers adjacent to the cobbled Parque Principal. It's a testament to this cathedral's beauty that many locals from Bucamaranga come to Girón on weekends just to attend mass here. To uncover the history of the place, you can embark on a walking tour of the city followed by a relaxing meal or coffee at a café on Plazuela Peralta, the site of Girón's founding in 1631. And if you make it here for Christmas, get ready for an incredible party. As mentioned, you can arrive here from Bucamaranga—or, you can combine Girón with a visit to Barichara (read below) located three hours south. 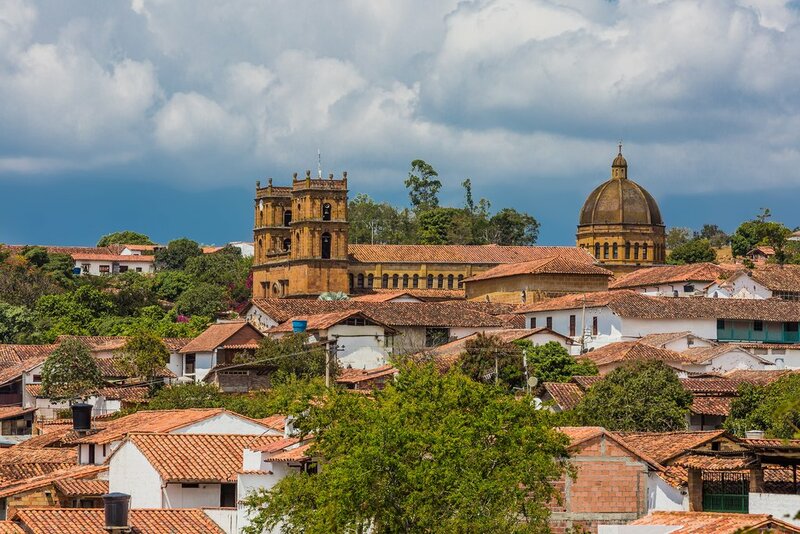 Barichara enjoys a reputation as one of the prettiest towns in Colombia, and its Spanish-colonial heritage and architecture have earned it the official title of Heritage Destination from the Colombian government. Even so, Barichara isn't that easily accessible, which means it's rarely (if ever) overcrowded with tourists. Everything is centered around a small, well-preserved plaza with tree-lined walkways and a stone fountain local children use to beat the mid-day sun. Fine stonework defines this town, an example being the impressive Catedral de la Inmaculada Concepción just above the plaza—it features a stone facade and an interior of polished sandstone as well. Walk a little ways above the church and you'll come to a mirador (lookout point) of the Suarez Canyon that might be the most impressive in all Colombia. Barichara has a unique culinary heritage. You'll notice the word hormiga appears quite a bit on menus. Translated, this means "ant," and these insects are a popular snack in town. Specifically, locals eat hormigas culonas, or fat-bottomed ants. They're often fried and salted and taste a bit like popcorn, but you can also find them in fancy restaurants cooked into sauces. There are a number of fun activities just outside Barichara. Go horseback riding through the canyon down to the Río Suarez Valley, or you can opt for a brisk hike from town. 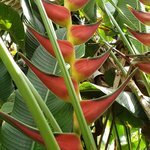 The most popular is a two-hour jaunt from the top of Barichara along a scenic trail originally used by the indigenous Guane tribe. The destination is the village of Guane, a sleepy pueblo seemingly lost in time. Or, head to nearby San Gil for adventure sports like river rafting, paragliding, and mountain biking. You can get to Barichara via a six-hour-drive north from Bogotá or a three-hour drive south from Bucaramanga. Many travelers make their base of operations in San Gil, as Barichara is located a mere 20-minute drive northwest of it by mountain roads. 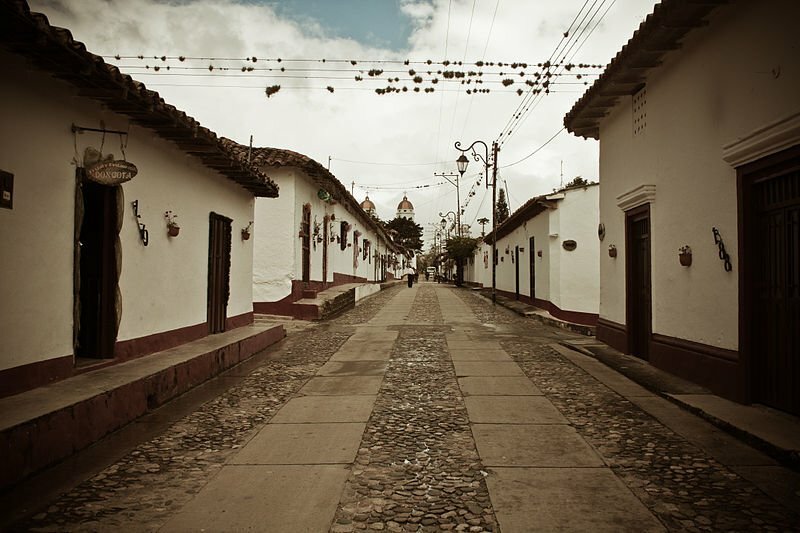 If your travels bring you to the Cauca Valley in southern Colombia, make Popayán part of your itinerary. Located in the Cordillera Oriental section of the Andes Mountains on the Pan-American Highway, the city enjoys a historic distinction. It was one of the first major settlements in Colombia, founded by the Spanish conquistador Sebastián de Belalcázar in 1534. 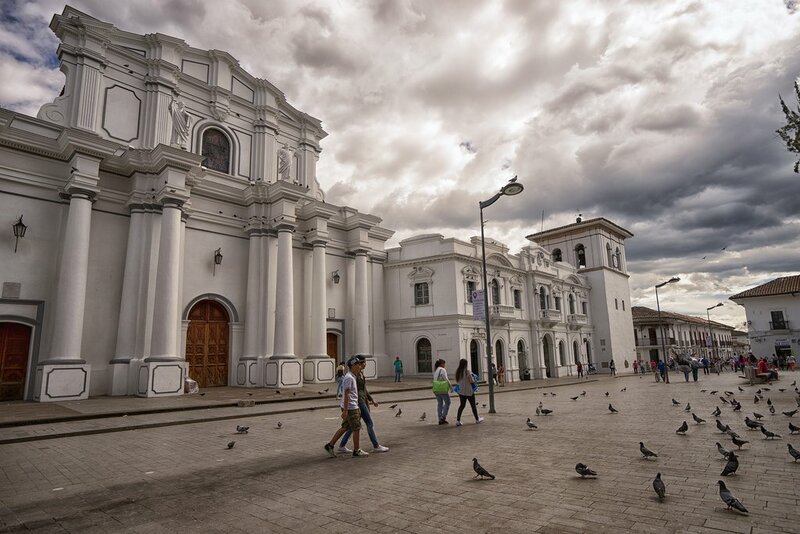 All around its well-preserved city center, you'll find the wide cobbled streets, churches, stone bridges, and terra cotta rooftops that have been a hallmark of Popayán from its earliest years. Popayán is easily accessible. It's a three-hour drive south from the Argentine salsa capital of Cali, and it takes a mere 20-minutes on foot to reach Popayán's airport from the city center. Stroll the historic central quarter, stopping at the major sites as you go—a highlight is the elegant Cathedral Basilica of Our Lady of the Assumption, located on the corner of Caldas Park. Built in the French style around 1900, it has tall colonnades and a 131-foot-high dome. It gets particularly festive during Easter week, with the largest processions outside of Sevilla, Spain. There are a number of excursions you can make from here to the surrounding Cauca Department, including Parque Nacional Puracé. About two hours outside of Popayán, it's home to the snowcapped Volcán Puracé, which towers over the region at 15,243 feet. Visitors can take multi-day hikes around the volcanoes and soak in the area's geothermal pools.